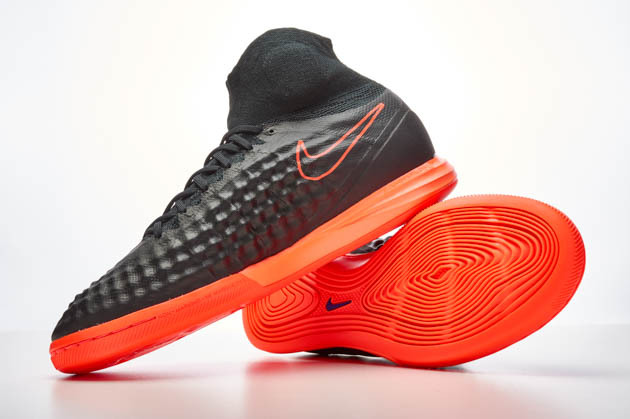 If there was one thing many soccer players, boot lovers and reviewers were waiting for, it was the introduction of the revamped upper on the Magista Opus 2. After making a name for itself with the first generation around the 2014 World Cup, the Opus used a KangaLite upper that offered incredible touch on the ball and was the perfect successor to the CTR360 line. Then Nike went to the same KangaLite upper on the Opus 2, but introduced control elements that looked more like a bad case of acne on the boot. 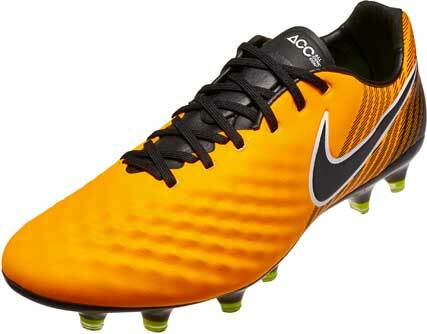 The control elements were highly scrutinized and led to the Opus becoming Nike’s least popular boot. However with the introduction of the Opus version 2, it is time for people to come back to the control line from Nike. Straight away, you can tell the Opus is back to its former glory. The Upper is softer and has more subtle control elements like the ridged areas on the upper that allow for the boot to have a 360 degree control upper. The upper is a little bit thicker than the V1 Opus 2 which is a plus for those who are like me and enjoyed the style of upper and padding found on the Opus 1. The colorway I chose to go with was the ‘Lock in Let Loose’ pack Laser Orange colorway. The colorway is certainly an attention grabber with the Laser Orange almost instantly becoming one of the brightest boots I have ever owned. The Opus 2 v2 is available in a couple of different colorways, all of which should be pleasing to anyone looking for a high quality control boot. The Opus 2 v2 reminds me of the original Opus in terms of comfort, touch, and all around performance. As mentioned before, the upper is a KangaLite material with Mesh underneath to allow for better control on more high use areas of the boot. This mesh texture creates the raised and lowered areas all over the areas where players will shoot and control the ball. The tongue is a hybrid tongue that is partially connected on the inside to prevent a lot of movement of the tongue while running and playing full matches and practices. The sockliner is one of my favorite on the market. It is an EVA sockliner with Poron foam inserts under the heel and the ball of your feet to allow a little extra comfort while playing. The soleplate is made up of half moon and bladed studs. The bladed studs create a circular pivot zone for easier ability to turn on a dime and go in any direction by digging into the ground and allowing easier twist. The moon shaped studs in the heel is a little bit longer to ease breaking sooner on a run. 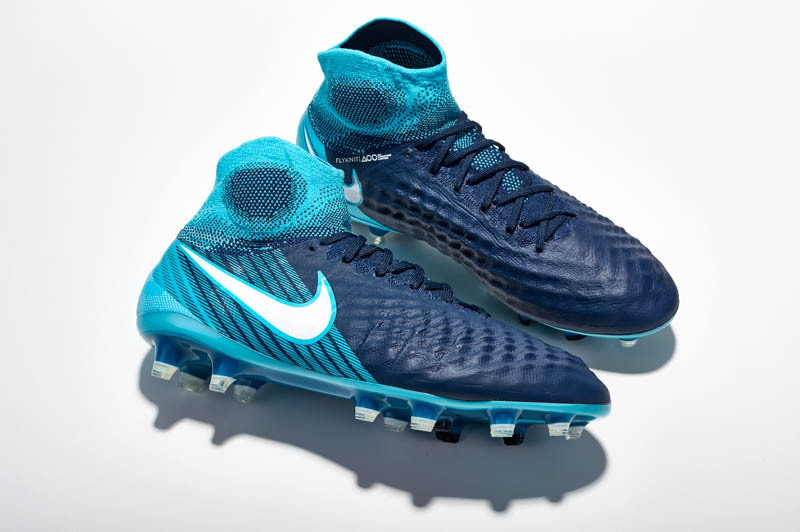 The boot ofcourse features the Nike ACC coating to allow for the same touch whether it be pouring rain or dry and sunny, which is always a nice added feature to any high end Nike boot. The performance of the boot is something that I was excited to test for. I still use my Magista Opus 1 boots whenever I am not testing one boot or the other and when I am playing in matches. The upper on the V2 felt padded and soft while controlling the ball (whether juggling in warmups or actual in-game scenarios). Running and turning in the boot are fairly normal, but I will add I did feel some of that extra breaking ability from the longer heel studs. 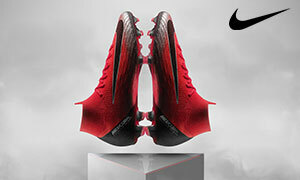 The turning aspect is fairly normal from any midfielder designed boot with somewhat circular studs. Shooting the ball is wonderful while wearing the Opus as the padding on the inside of the boot allows the sting you would normally feel from a well-hit strike to be absorbed by the padding. The 360 degree kind of upper is perfect for controlling the ball no matter how you have to turn or twist your foot to stop the ball or hit a pass. This uniformity across the foot gave me more confidence to pass the ball with the outside of my foot a little bit more often since I would have more padding. While testing, I found zero issues with the stud pressure or any discomfort in the boot. I have a little bit wider than average feet and sometimes that can give me issues, but I prefer my boots to be rather tight and to fit perfectly with virtually no extra space. After nearly 3 weeks of rigorous testing, there are zero stress marks or tears in the boot and there seems to be no issues in terms of durability from what I can tell. The Opus v2 can be purchased over at SoccerPro.com and is even on sale at the time of posting for an incredible price of only $169.99 in the Lock In Let Loose pack colorway. If you can find the Opus in this new upper for a price like that, I would recommend picking it up for your next boot. Overall, the Opus v2,is my kind of boot. Comfortable, soft and padded upper, and one that allows a 360 style touch across the boot. 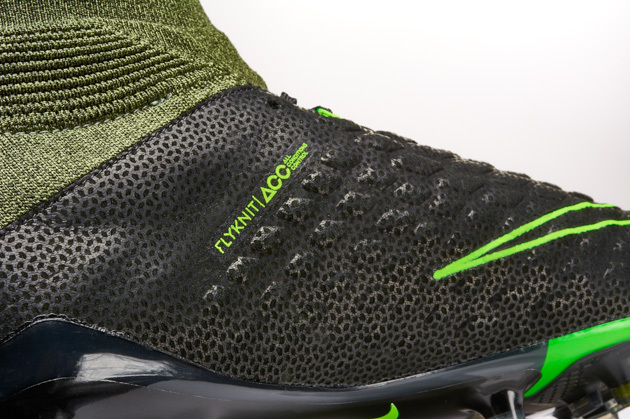 The Opus v2 has finally gone in the right direction for the line and if Nike were to do more of the same in terms of having this KangaLite upper and a mesh underbase that allows for better control elements, then I am ready to see where Nike takes the next Magista Opus 3.